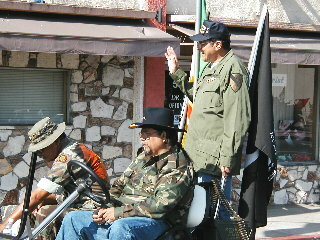 (November 5, 2005) -- LB's Veterans Day Parade stepped off at 10:00 a.m. today (Nov. 5) from Atlantic Ave. at Harding Ave., rolled down Atlantic to 56th St., then returned back to Houghton Park for a ceremony honoring veterans. 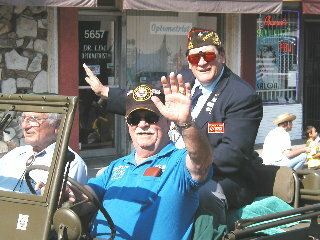 Veterans Day is officially marked on Nov. 11: the 11th month, 11th day, 11th hour, marking the armistice of World War I...then called "the war to end all wars." 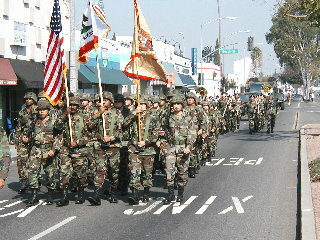 Attendance at this year's parade (nearly a week before the official observance) was visibly thinner than in past years. 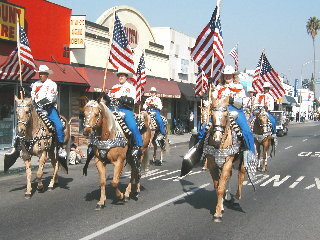 LB's ceremonial Mounted Police unit was near the head of the parade. 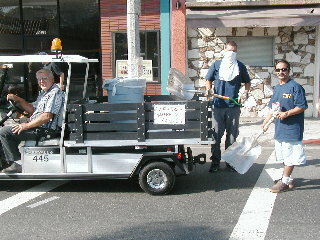 This shovel brigade followed. 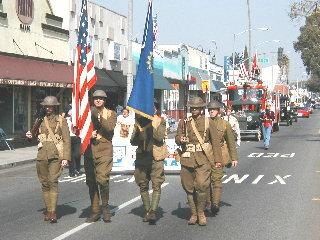 the equestrian unit. 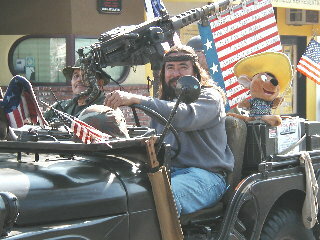 Its sign wisecracked, "Meadow Muffins, 75 cents." 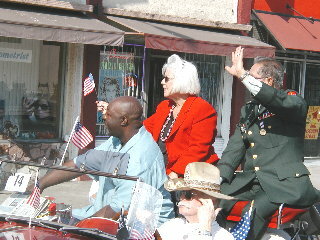 LB Mayor and U.S. Conference of Mayors President, Beverly O'Neill. 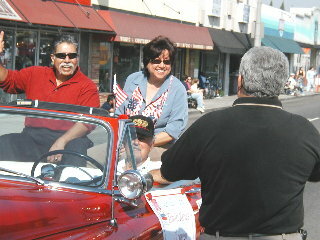 The Mayor is riding in her final LB Veterans Parade as Mayor. 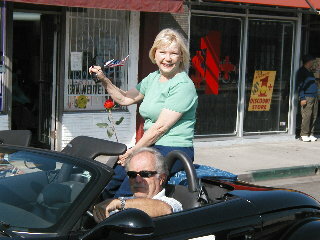 She's been part of the parade since its inception under former Councilman Jerry Shultz nine years ago. 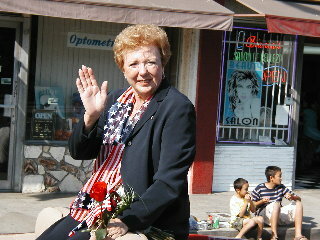 LB Vice Mayor/5th district Councilwoman Jackie Kell. 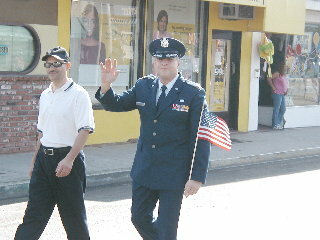 In uniform, LB City Prosecutor Tom Reeves (Colonel/Staff Judge Advocate, CA Air National Guard). 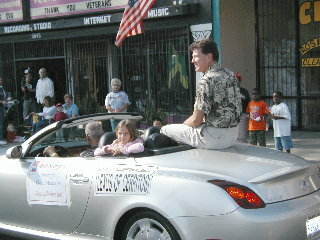 2d district Councilman Dan Baker. 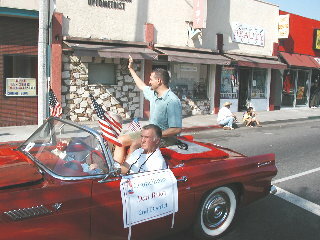 3th district Councilman Frank Colonna. 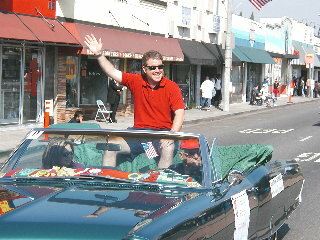 4th district Councilman Patrick O'Donnell. 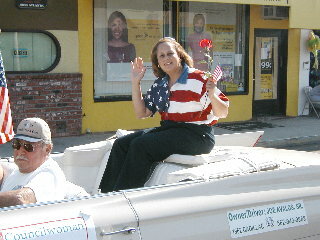 6th district Councilwoman Laura Richardson. 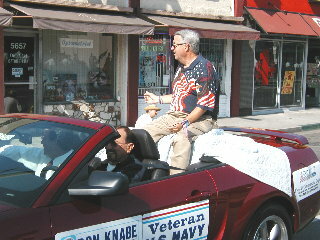 9th district Councilman Val Lerch (trademark morning coffee cup in hand) with family members. 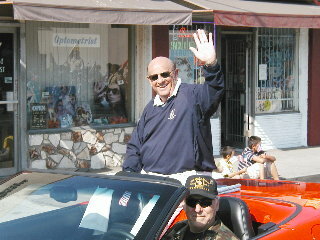 Councilman Lerch served in the U.S. Coast Guard for 23 years. 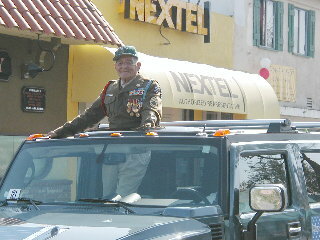 He walked the parade route, shaking hands with spectators. 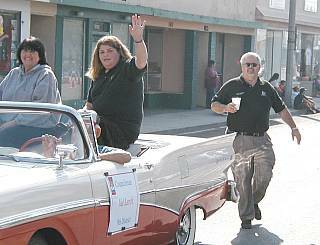 Councilman Lerch greets fellow LB Councilmember Tonia Reyes Uranga and spouse/LB Community College Board of Trustees member Roberto Uranga. 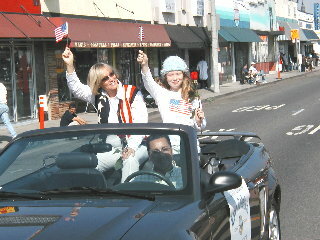 8th district Councilwoman Rae Gabelich alongside family grandkidlet. 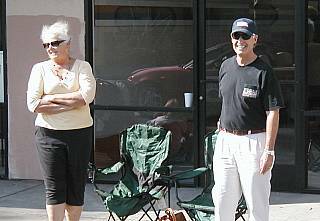 Among the spectators. 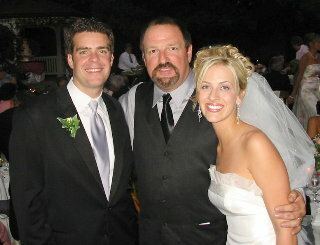 WLB power couple Patti and Nick Sramek. 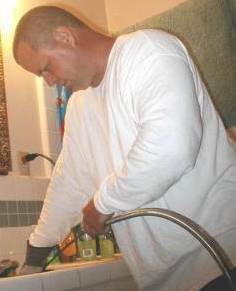 Mr. Sramek serves on the Planning Commission; Mrs. Sramek is a field aide to Councilwoman Reyes Uranga. 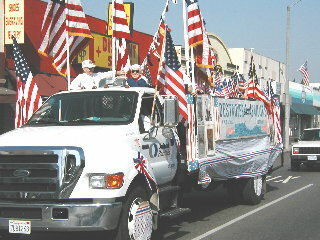 One of several servicemembers' floats. 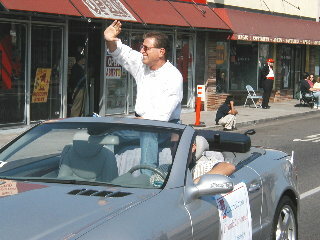 Grand Marshal, Olympic Gold Medalist (LB Marathon exec/Int'l City Racing CEO) Bob Seagren. 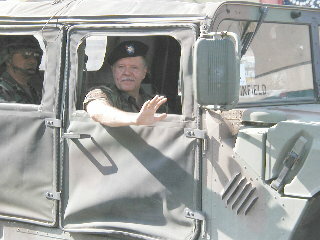 In uniform and in military vehicle, retired LB Councilman Jerry Shultz, Vietnam Vet, Bronze Star recipient. 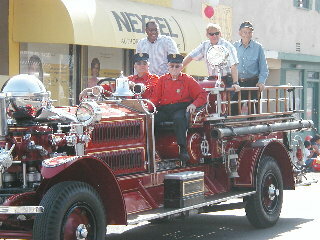 Atop this classic fire truck, Braden Phillips (second from right), Captain, USN Ret., Manager, LBPD Administration Bureau. 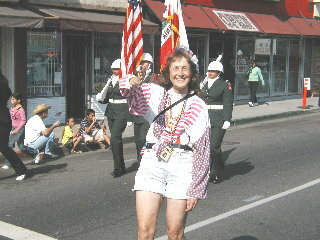 LB photojournalist Diana Lejins. 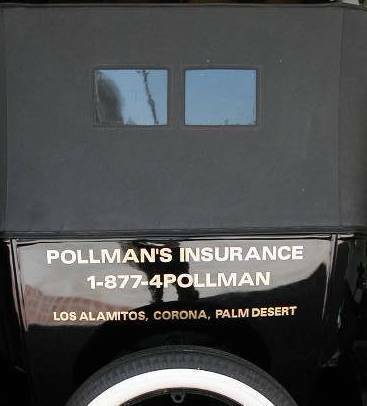 She's on roller skates, although we managed to miss that part of the shot (which is why she's a photographer and we're not). 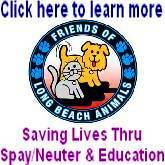 Friends of LB Animals took part and saluted Dogs in Combat. 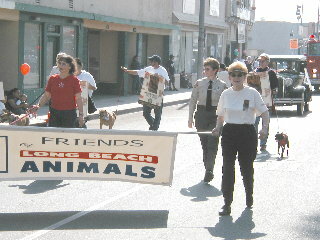 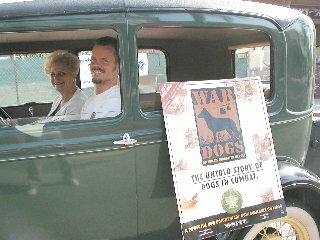 Friends of LB Animals president Shirley Vaughan rides along.